The annual Celebrating Animals gathering was held Saturday at Veterans Memorial Park in Sierra Vista. Jamison Taschendorf, 2, becomes friendly with a boa snake at the Huachuca Area Herpetological display during Saturday’s annual Celebrating Animals gathering in Veterans Memorial Park. Older brother Kayser, 6, looks on. 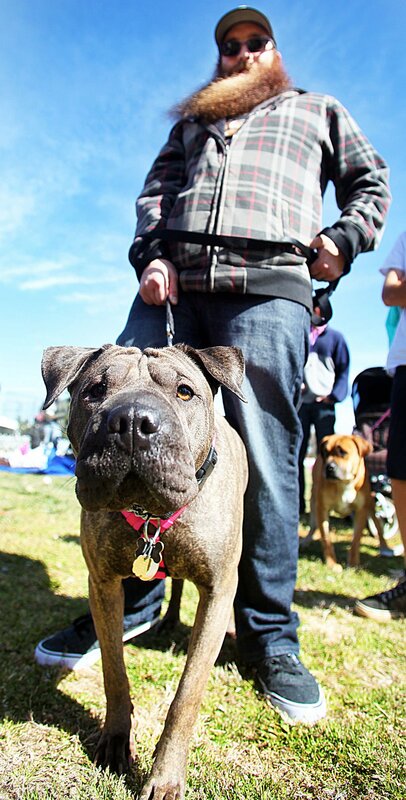 Brian McReynolds stands with his 4 year-old Shar-Pei mix Sasha while waiting in line at Saturday’s annual Celebrating Animals affair at Veterans Memorial Park. ASAVET Charities was on hand to provide free rabies vaccinations and microchipping for dogs and cats. Kat Carrier shields her chihuahua-mix Chili from the cool winds blowing at the event in Sierra Vista. Four-year-old Emery Hiles gets acquainted with a 4-H duck Saturday at Veterans Memorial Park. Audra Atchinson, 6, meets a U.S. Border Patrol steed at the Celebrating Animals event. MARK LEVY HERALD/REVIEW Jacob Torres, 12, hauls his 2-month-old shepherd-Malinois mix after the pooch received its vaccination.